You may be familiar with NPI products – RAM® Mounts, IntelliSkin®, and GDS® Technology™ – that so many people use around the world. But you might not be as familiar with the mission, vision, and core values that define our company. Backed by 360 employees, we’re proud to share this behind-the-scenes look at what makes RAM® Mounts the leading manufacturer of device and equipment mounting solutions, and how it all fits into each and every product we make. 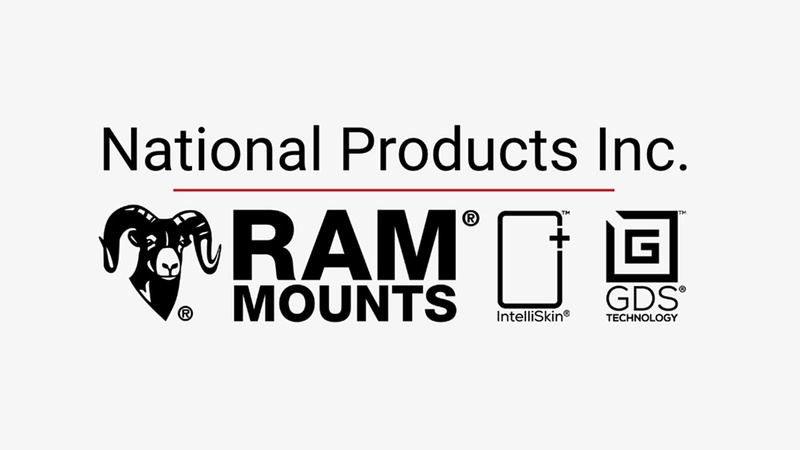 RAM® Mounts shares NPI’s mission to manufacture inventive solutions that improve lives, and NPI’s vision to be the world leaders of premier mounting solutions. We take pride in applying the core NPI values in everything we do. If you’re interested in joining the RAM® Mounts by NPI team, check out the current openings on our careers page. So every company starts somewhere, and a lot of companies talk about being started in a garage. Here at NPI, not only was our first building in a garage, but our second one was too. In 1990, Jeff Carnevali founded National Products Inc. – manufacturing an innovative solution to remove propellers off of boats. As he became an inventor known in the marine marketplace, he listened to customers requests, and created RAM® Mounting Systems as a response to their needs. While we don’t make propeller removal tools any longer, the original core group of people that came together in those surroundings did so not because of the environment, but because they shared a love of manufacturing products that solved problems. As NPI has evolved over the years, a lot of things have changed. But the core essence of manufacturing products to make our customers lives better has not only lived on – it’s intensified. Hi, I’m Jeff Carnevali, founder and CEO of National Products Inc. – the manufacturer of RAM® Mounts, IntelliSkin® and GDS® Technology™. When it came to articulating our mission, vision and values with employees, the idea was to bring the company closer together under a unified goal – gathering input from people who have been with us for more than 20 years and from new leaders who bring a fresh perspective. We carefully crafted these core beliefs to take into consideration all the roles here at NPI, and our purpose for why this company exists. I believe a team is only as good as the sum of its members, and by understanding who we are, why we’re here and where we want to go, we’ll have the best chance of making this the best company possible. With that said, I’m excited to share our mission, vision and values. At NPI, our mission is to manufacture inventive solutions that help improve our customers lives. Our mission is our purpose. It’s why we’re here doing what we do today. From the very beginning, we’ve always been driven to create unique products that help our customers in their experience in whatever they’re doing. We truly care about our customers and the people who use our products. We will always manufacture inventive solutions that improve our customers lives. That’s why we chose this as our mission statement. Our vision guides us to achieve our goals. From the quality of the parts and the innovation of our products to the service we provide our customers, we take pride in what we do. We want RAM® to be the name people go to first. At NPI, our vision is to be the world leaders of premier mounting solutions. Our core values define who we are as a team. They drive how we treat each other and how we do business. Together we’ve selected our core values that best represent who we are as a company. Our core values are – taking action. We move efficiently and responsibly to achieve the intended results. At NPI, we believe in moving fast and efficiently. From creating a new solution all the way through product to final delivery. Commitment. We persevere through the challenges we face. We value commitment to each job role, with the understanding that every role in the company adds to the big picture. Our next core value is honoring relationships. We believe in being candid, learning from each other and finding joy in the work we do. We value being honest, having integrity and working together, and supporting each other as a team to produce results. Customer focus. We listen carefully and respond effectively to provide the best solutions. Oftentimes, we’re able to anticipate the needs of our customers and design proactively to fill that need before it arises. We have thousands of components to produce some of the most inventive products companies have dreamed of. We also value the opinions of our customers, and gather feedback to implement across all departments to inspire positive improvements about our company. These values will guide how we hire new team members, how we make decisions, how we encourage each other and in determining if we’re doing the right thing at NPI. They will guide our actions as we continue to strive to deliver on our mission and vision. I’d like to thank each and every one of our employees, partners and customers for all their contributions to help get us where we are today. As we continue to grow, I challenge each and every one of you to not only know the mission, vision and values, but to live them in your everyday life here at NPI.